I love a quick stir-fry meal! It makes for a quick weeknight dinner, or even packed up for lunches. I love the fresh veggies, and the different variations you can make with them. Enjoy! Thinly slice the sirloin steak, slicing across the grain of the meat. Place into shallow dish for marinating. Seed and slice the red bell pepper. Slice the green onions, diagonally to make 3/4-inch long pieces. Heat the canola oil over high heat in large skillet or wok. Add the beef slices and marinade and saute over high heat for 5 minutes. Add the sliced red bell peppers and green onions and saute for another 5 minutes. In a small bowl, stir the 1 Tbsp cornstarch with 2 Tbsp warm water, then swirl into the sauce in the skillet. Reduce heat to low and simmer for 5 minutes, while sauce thickens. 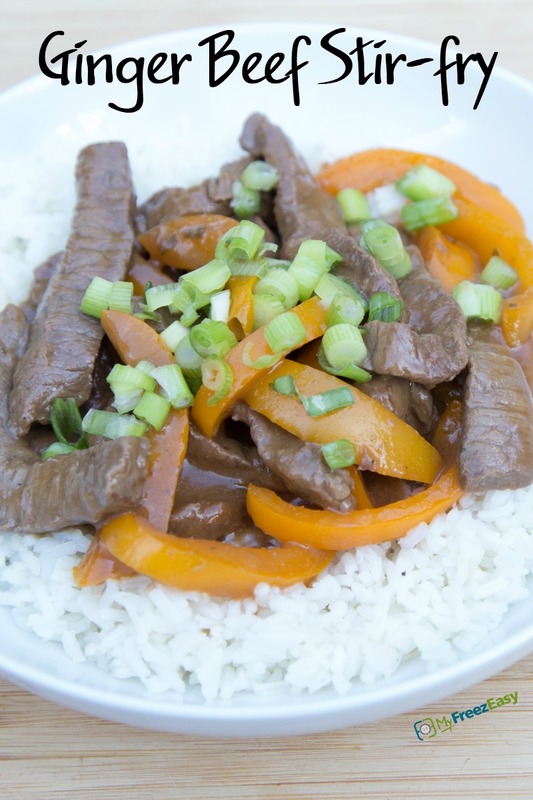 Serve Ginger Beef Stir-fry over rice with egg rolls. Thinly slice 3 lbs. sirloin steak, slicing across the grain of the meat. Seed and slice 2 red bell peppers. Slice 2 bunches of green onions diagonally to make 3/4-inch long pieces. In a small mixing bowl, whisk together 2 Tbsp rice vinegar, 6 Tbsp soy sauce, 4 Tbsp sesame oil, 2 Tbsp honey and 2 tsp ginger. Put baggie in the freezer and freeze up to 6 months in fridge freezer or 12 months in a deep freezer. Thaw in the fridge overnight, or a warm bowl of water for about 20 minutes, before transferring to skillet for cooking. Stir in cornstarch and water, as directed in the recipe. Thaw and saute over high heat to cook the beef. 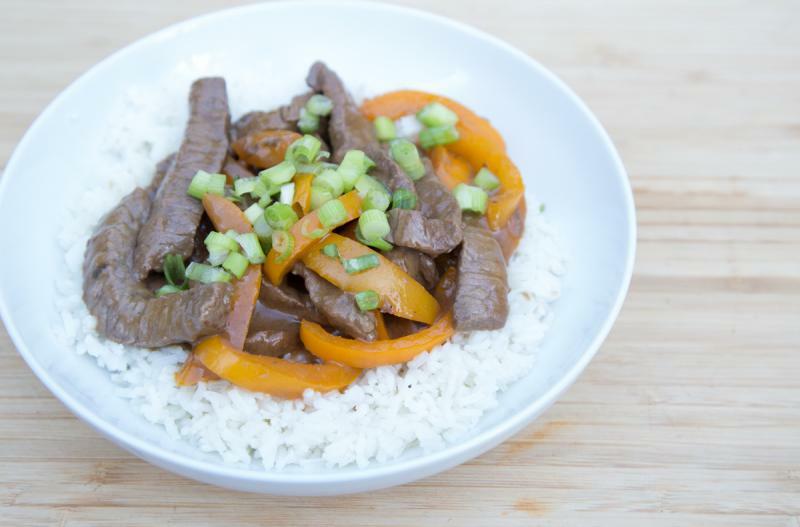 Stir in 1 Tbsp cornstarch with 2 Tbsp water at the end of cooking, to thicken the sauce.